While glancing through a boating magazine one day, I noted the Coast Guard Auxiliary offered a free on line VSC (Vessel Safety Check). Curious, I went to my computer and typed in free Vessel Safety Check and up came over a million pages. Whoa - this was not going to be as easy as I thought. As I began to wade through them I saw, like most topics on the web, there were good and bad. Some of the sites were out and out advertisements for products and various groups, thinly disguised with a few safety check topics included. One of the sites titled, “Boating Safety” had a U.S.C.G header saying the site would be “fun and interactive.” It was so confusing I simply could not navigate it at all and quickly moved on. 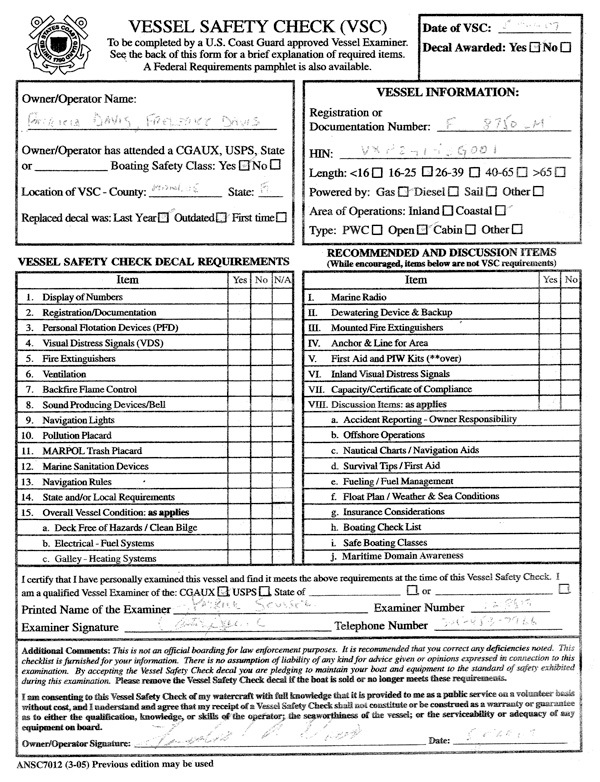 Many sites required specific software to view, such as the Coast Guard’s entire Vessel Safety Check Manual. To view the PDF format you needed Adobe Acrobat but if you were able to open it there were 40 boring straight text pages to plow through. If you made it to the end, there were yet another 40 pages of text with cute line graphics and pictures. I encountered many outdated sites; one actually claimed the Coast Guard was part of the United States Armed Forces. As most of us are aware, the Coast Guard is now Homeland Security, a distinction they acquired soon after 9-11. It would be hard to trust any information presented on such a site. As I continued my search, I came upon what I considered the number one site sponsored jointly by the U.S.C.G, U.S. Coast Guard Auxiliary and U.S Power Squadron. The site was current and very helpful announcing right on the front page, “ 15 reasons why your vessel may not pass a Vessel Safety Check.” This statement challenges you to enter and find out how your vessel would do. As I “cruised” through the site, the text with associated photo graphics alongside was very comprehensible and easy to review. To find this site type into your browser National Department of Vessel Safety Checks and you should go right to it. I feel the statement being promoted, “Free Vessel Safety Check online” is misleading and can easily confuse those seeking to save time. The online experience DOES NOT result in a certificate or safety inspection sticker being issued. It is just a review of what will be checked and a referral to an actual vessel examiner. The method to find an examiner is done by typing in your zip code and a distance you would be willing to travel. You are given a choice of examiners nearby or if there are none within the distance you chose, you would type in another. To actually reach an examiner you must type in all of your information and they will contact you. Many of us are reluctant to provide personal data online so this step may limit participation. I actually spent an hour and a half browsing to just get started reviewing the information. I conclude, as in many cases, a great deal of time can be wasted on the internet. An easier, simple way to get your vessel checked is call or stop by a Coast Guard Station or Sheriff’s Marine Office, or contact a member of your local Coast Guard Auxiliary or Power Squadron. Make a request for information on the exam and how to contact an examiner. Find out what items will be checked and are required, and then examine your own boat first. As you check the list, repair or replace any items you think may cause a problem. When ready, call the examiner and set up an appointment. As a boating safety advocate, I recommend working with a “person” not a machine to obtain education. They will provide a wealth of information the web simply does not have. Most vessel examiners are also boating safety instructors and fellow boaters. As your inspection proceeds, they will often share with you their experience and knowledge. Although I am a past C.G. Auxiliary, Power Squadron and State DNR instructor, when it came time for my vessel exam this year in the Florida Keys, I still enjoyed discussing safety topics with my local examiners. I learned about changes and updates on equipment I was unaware of. I met another Auxiliary member, Joel Aberbach, Captain, Division 6, Seventh CG District, Miami while at the Miami boat show. When I told him about the Free Safety Vessel check online he agreed to check it out and send me his comments. He said, “I must tell you, I had no idea how many hundreds of VSC items are on line on so many pages. If one were to read each one there would be little time left for boating. I conclude the most effective way to have your boat checked for safety equipment is face to face with a qualified examiner. The exam is set up to be a learning situation enabling the boat owner to ask questions and get responsible answers. Legal requirements are not our only concern, we wish to address other essential equipment such as; marine radio, anchor and anchor line, charts – defining security zones (not a good idea to approach a Navy war ship at high speed closer than 500 yards) and more. Most Vessel Examiners are also active in SAR (Search and Rescue) giving us unique experience to understand how and why boaters get into trouble and how to get out of it too. If you want to use the internet to prepare for an exam, I suggest you go to http://nws.cgaux.org/index.html. Click on visitor then vessel safety checks. You’ll also find valuable information on Boating Safety Courses, Membership in the Coast Guard Auxiliary, Float Plans and more.” I agree with Joel, the U.S.C.G. 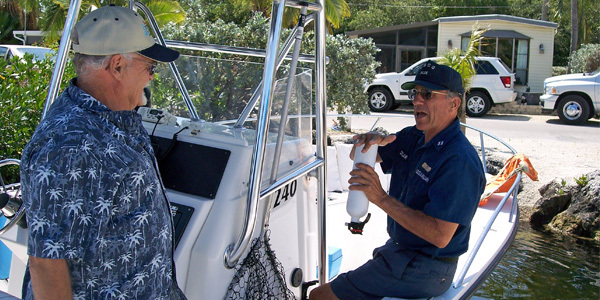 Auxiliary and U.S. Power Squadron offer many classes on boating safety and operation. They also offer membership and training to become an instructor or vessel inspector. These are great opportunities to meet new boating friends and build life-long relationships.